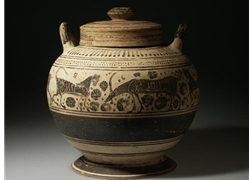 This is a beautifully decorated vessel from Corinth, Greece; it is commonly called a pyxis (a usually round container for cosmetics, ointments or trinkets; plural pyxides; however, the term pyxis is found mainly after the fourth century B.C., whilst contemporary references use the word kylichnis). The convex body of this vessel is decorated in black with a motive that was popular with certain artists in Corinth, a frieze of animals. In this case there are four panthers and three goats in alternating order. Around these there are rosettes and dots in the field. Above and below the central field are bands of concentric circles, with dots and rays above. The vessel has a flanged ring base, the underside of which was also decorated with a series of concentric circles, and two upright handles. A raised lip is there to take the lid, which is knobbed and was decorated in red and umber with a number of encircling bands.